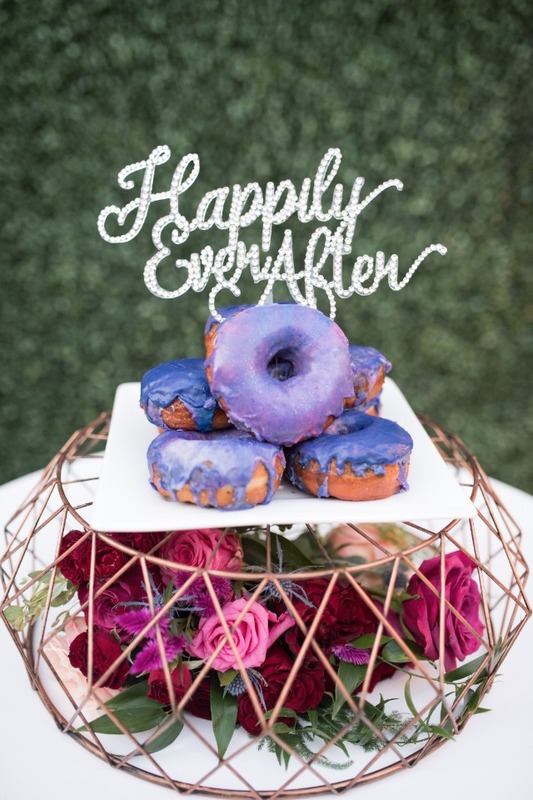 Okay if you can quit drooling over those donuts for a few minutes we would like present to you these pink and purple modern warehouse wedding ideas! Wait! Don't let the words modern and warehouse scare you off! 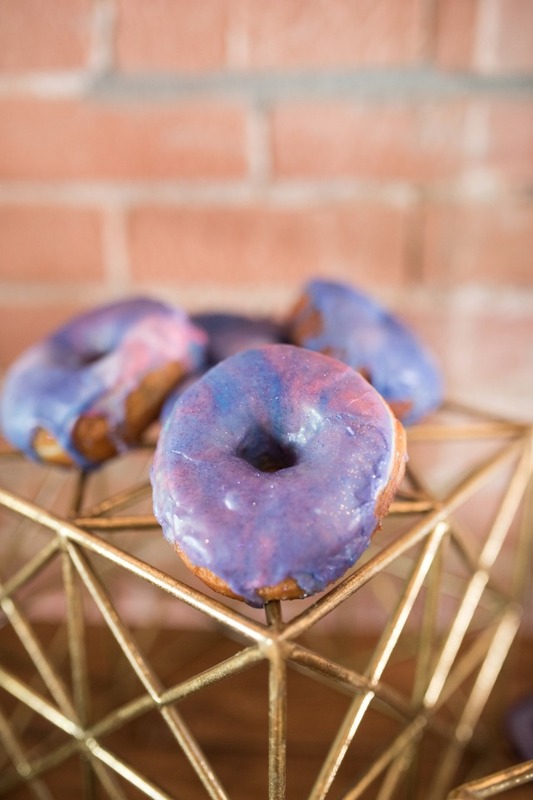 This shoot is well worth more then just a passing glance, plus if you stick around to the end there are more purple donuts for you! 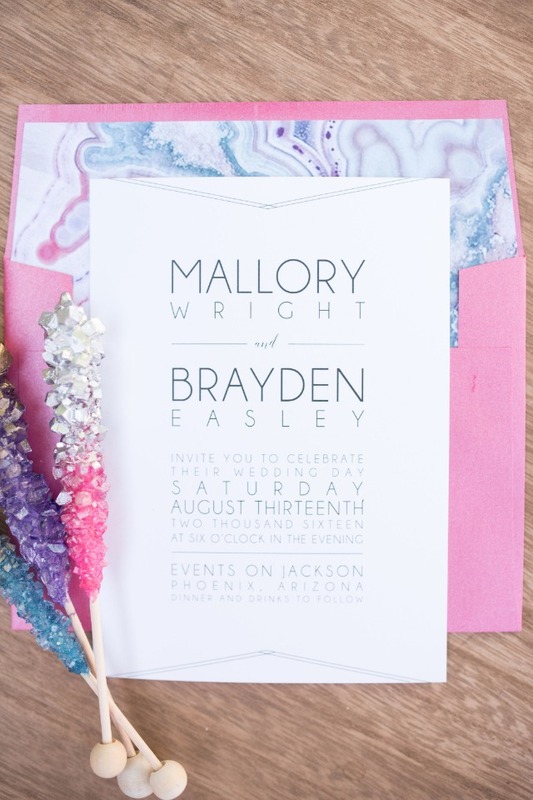 But seriously, we LOVE this wedding inspiration designed by Your Jubilee at Events On Jackson! 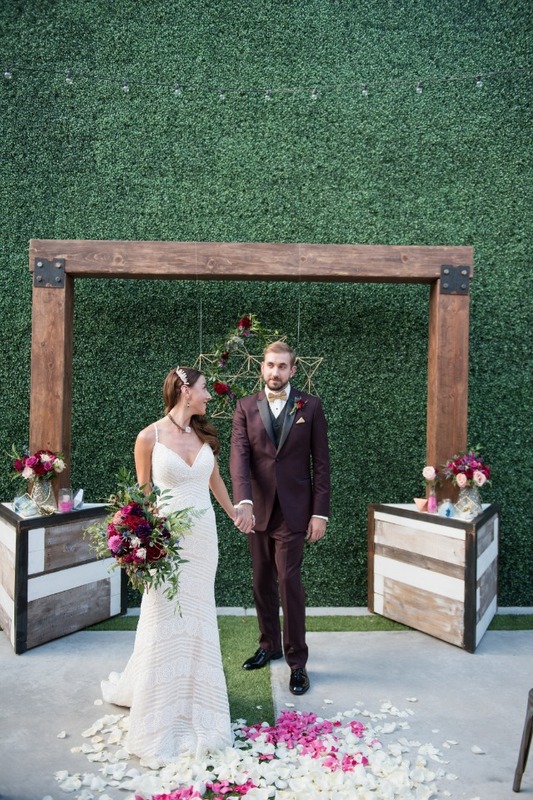 There was just so much to see and we want to share it all with you, so be sure to check out the full gallery, it's filled to bursting with wedding inspiration thanks to Marisa Belle Photography! 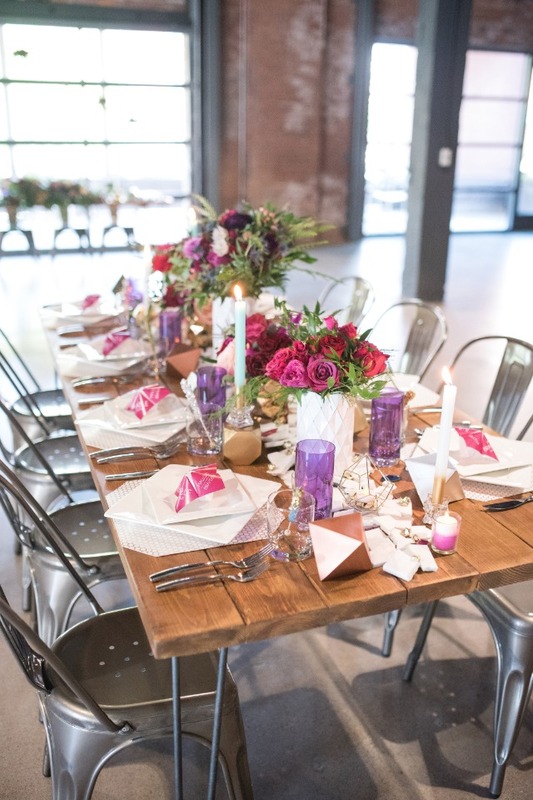 From Your Jubilee: What do you get when you combine geometric shapes, natural stones, bold colors and a restored downtown warehouse? 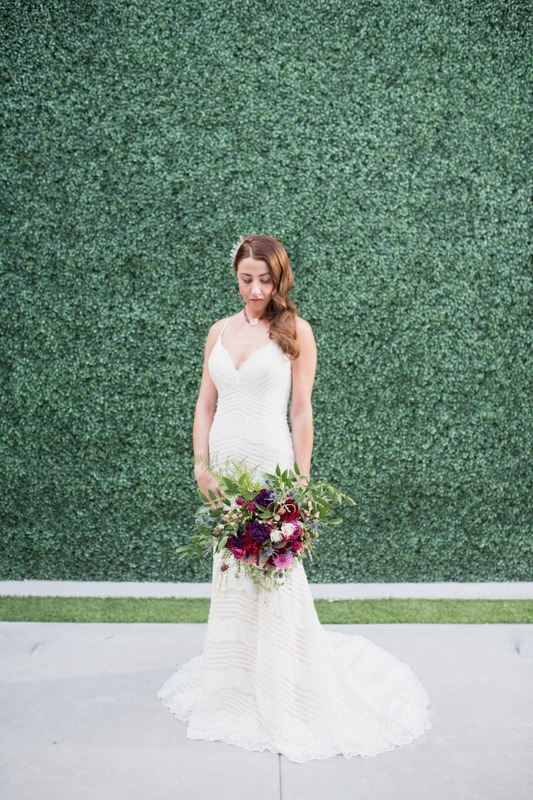 A styled shoot with loads of texture, dimension and style. 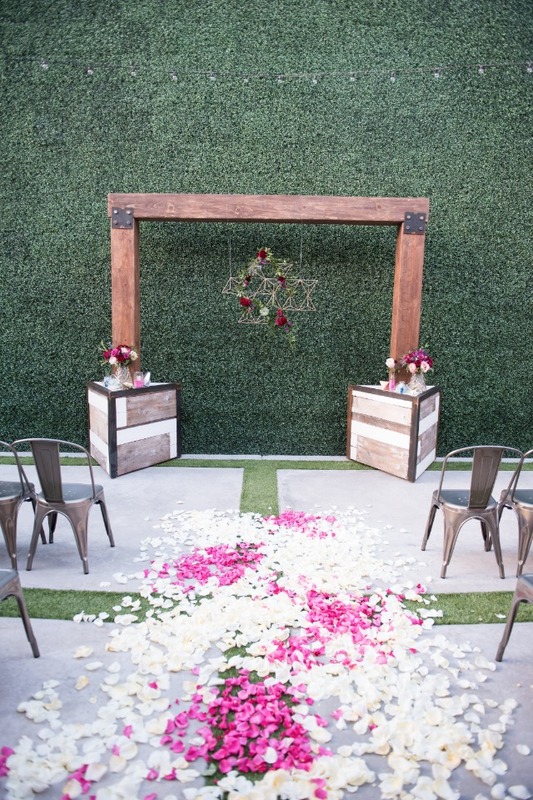 From one of a kind arbors to smashed marble and metallic geometric pieces, all the details married together to create swoon-worthy inspiration. 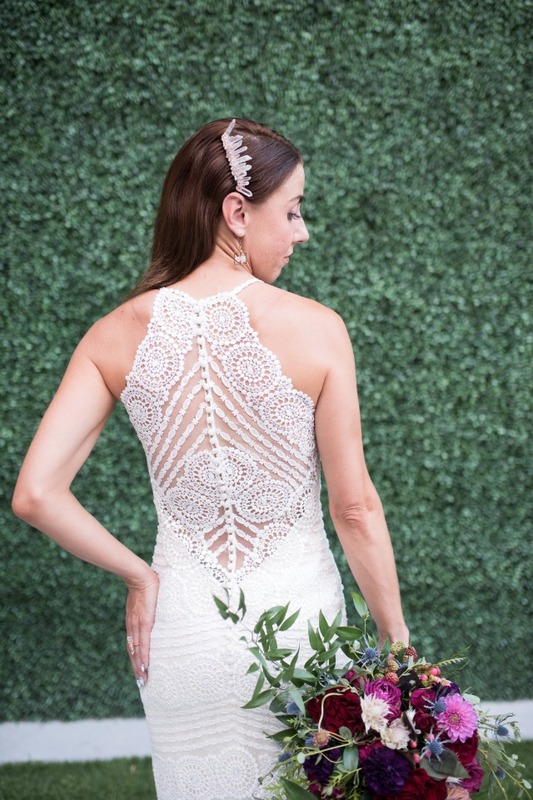 The bride wore a beautiful, geometric inspired lace gown from Lillian Lottie, accented by a crystal headpiece. 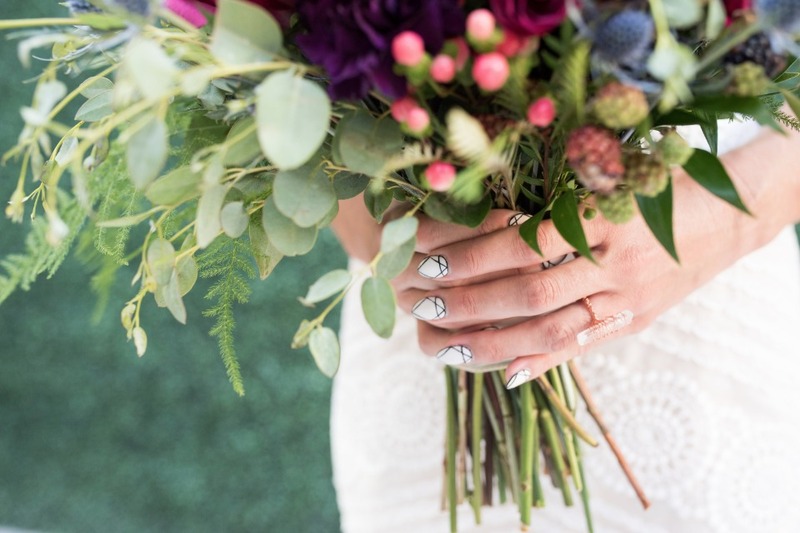 Even her nails got in on the geometric vibes with a custom geometric nail design. 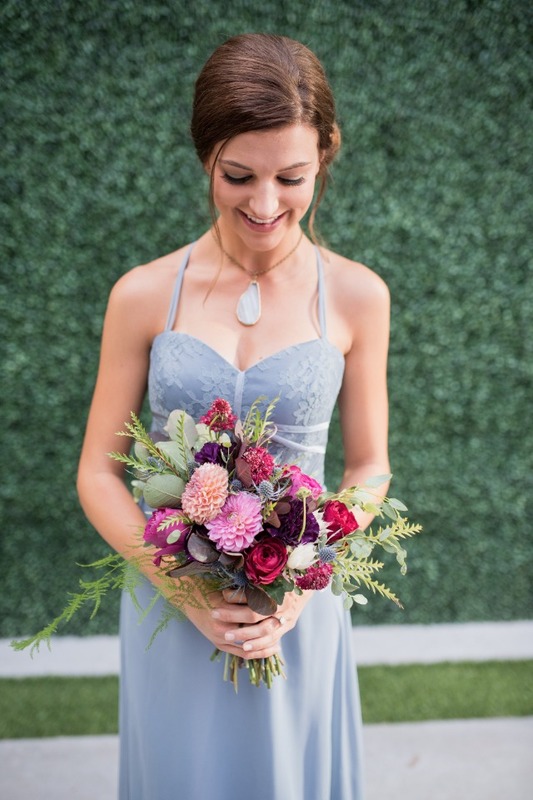 We loved the way the bouquet's blue thistle was brought out by the bridesmaid's serenity blue gown with geometric detailing from Bella Bridesmaids. Both wore natural stone and crystal jewelry from local artist, All The Tiny Pieces. 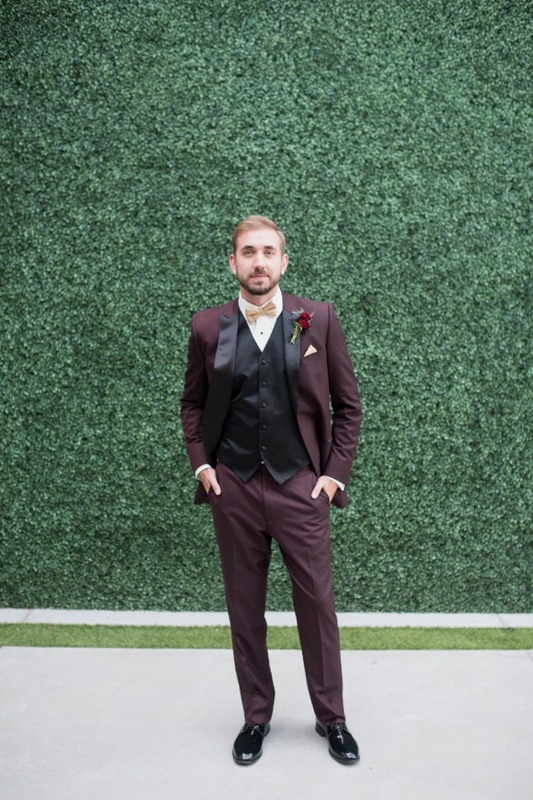 The groom was dashing in a marsala suit from Celebrity Tux And Tails and his gold details were matched by his groomsmen. 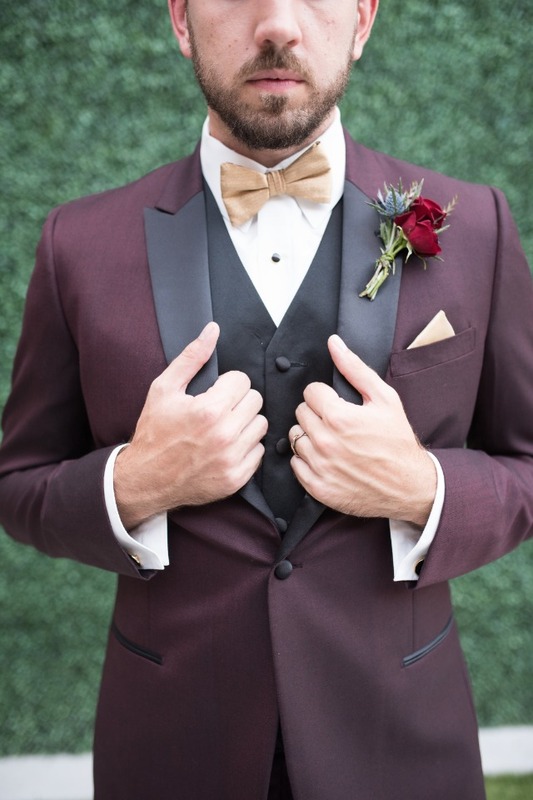 If this wedding style has you swooning, we have some great news! We have more ideas to share with you! 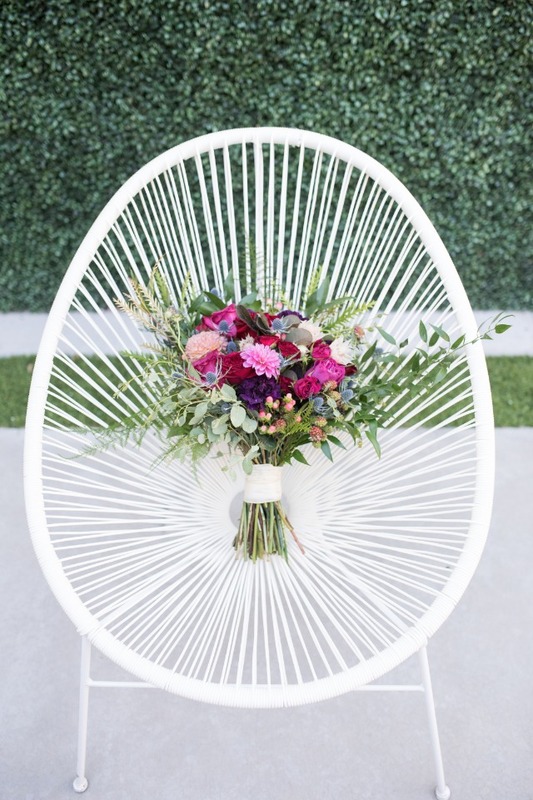 Check out these Modern Classic Wedding Ideas, we know you'll love them! 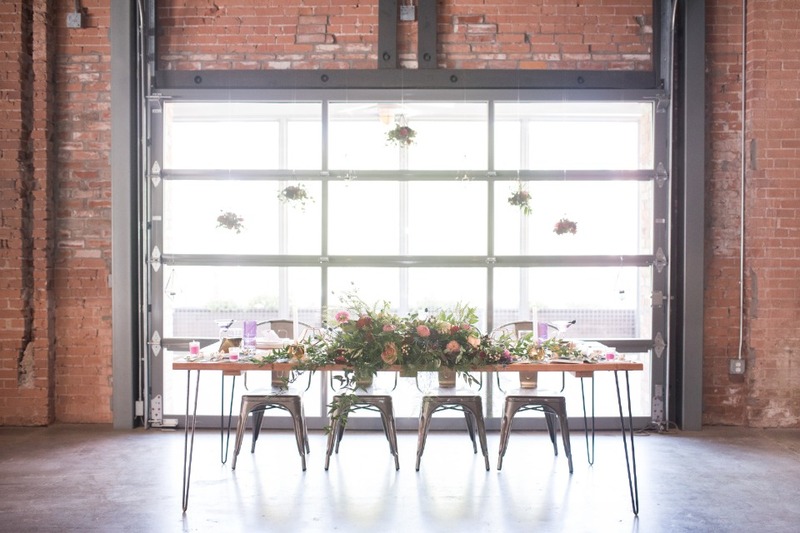 Hanging behind the head table were iron geometric diamond dripping with flowers. 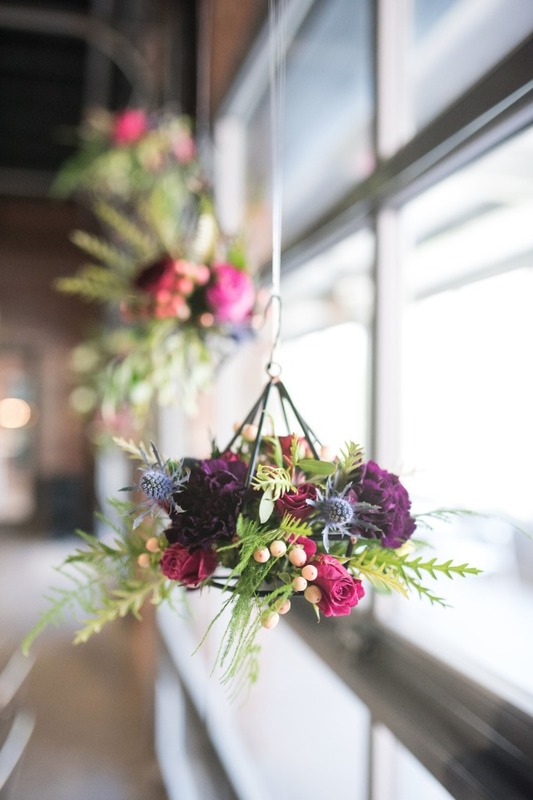 The Wildflower AZ used structural blooms like Dahlia's to create incredible texture in the centerpieces and bouquets. 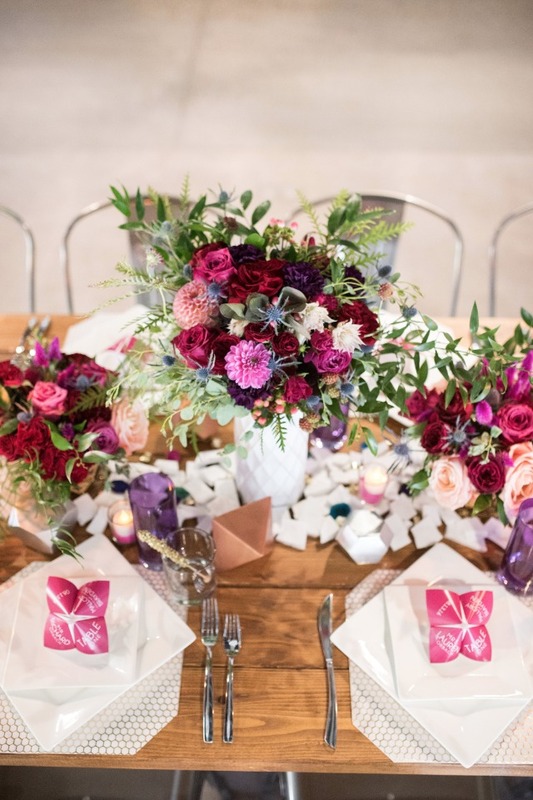 To create a unique runner, marble tiles and pieces of stained glass were broken and then scattered around candles, floral and vases. 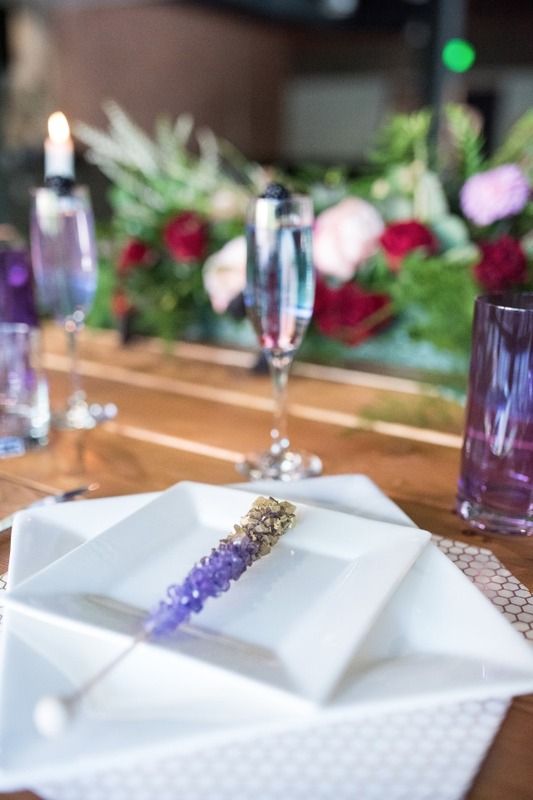 Square plates sat atop honeycomb placemats next to bold glassware. Our favorite element was the place card/menu "cootie catchers". 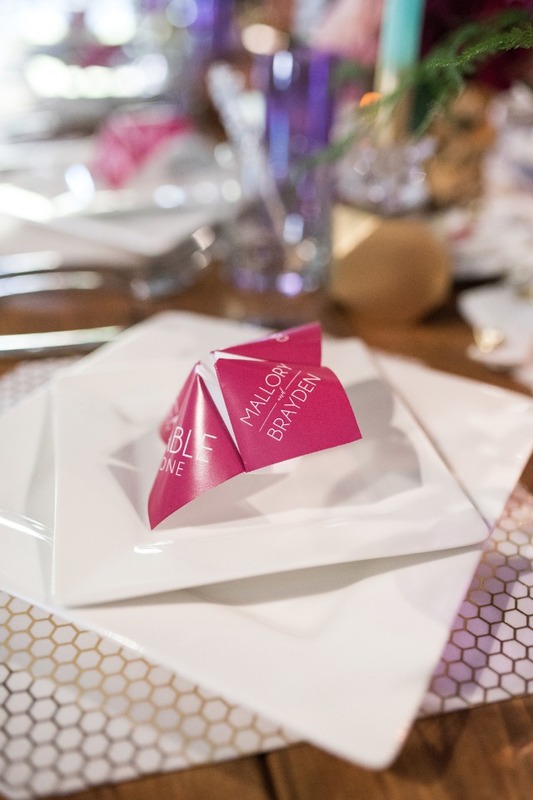 They captured the 3D geometric style, while providing a new and interesting alternative to the traditional menu and place card. 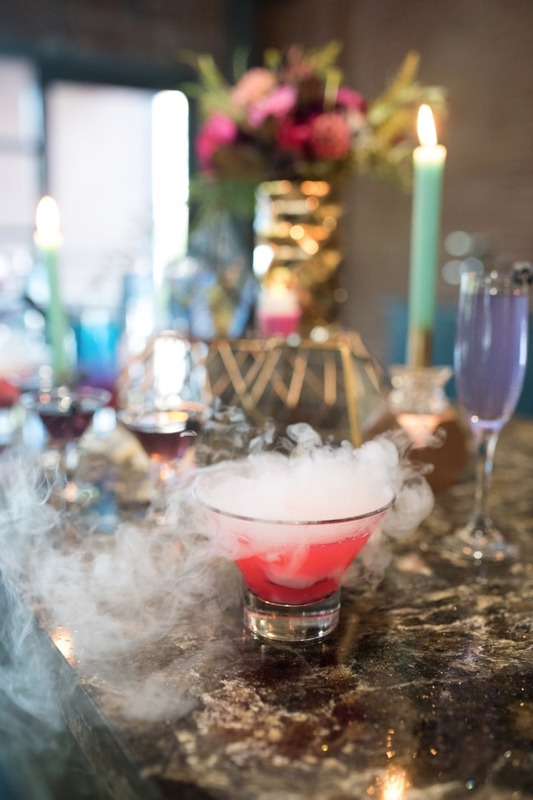 Beautiful ombre drink options made the gorgeous built in bar at Events On Jackson a little brighter. 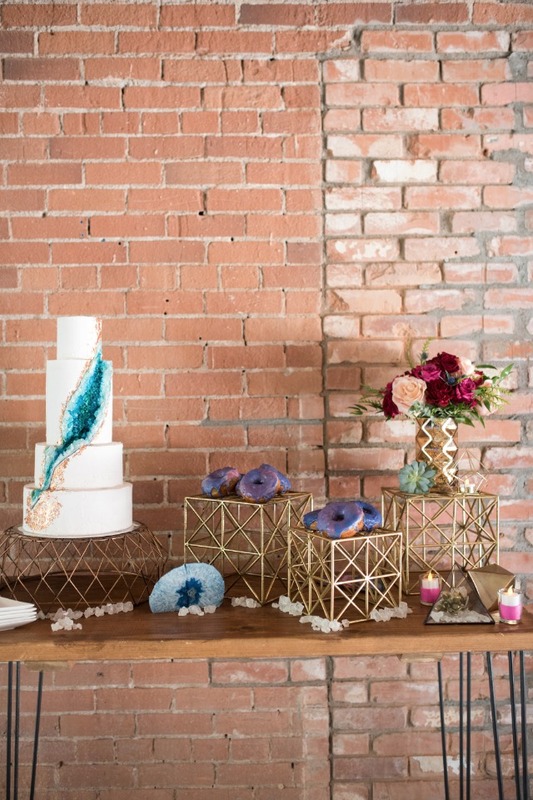 The dessert table featured rock candy accents and a copper geometric cake stand. 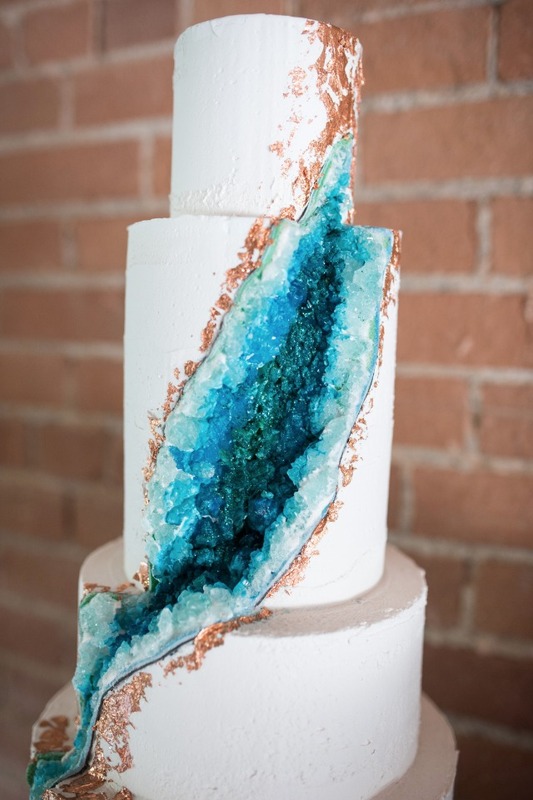 The incredible agate cake was made by 21 Cakes and were accompanied by marble donuts by Bear And The Honey.